Artichokes can be intimidating for the beginning cook but they are truly easy and quite delicious! If these directions don’t do it for you check out youtube for a tutorial. With a sharp, serrated kitchen knife, cut off about one inch from the top of the artichoke, removing the sharp tips. 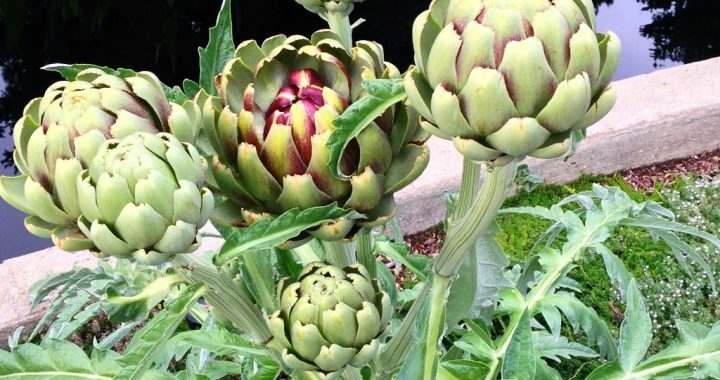 Remove the stem close to the base of the artichoke along with the tough bottom leaves. Rub the cut portion of the artichoke with the juice of a fresh lemon to prevent it from browning. Put the artichokes in a pan with a steamer insert and steam, refilling the water as necessary, over medium heat for about 20-30 minutes until the leaves are softened and the bottom of the leaves are tender enough to scrape off with your teeth. Remove and serve with lemon butter sauce. Posted in Recipes, Veggies and tagged artichokes with lemon butter, recipe. Our newsletter "The Herb Blurb" offers plant and gardening information, local events, recipes, and updated class, workshop and retreat schedules. © 2008- 2019 Chrysalis Herbs | All Rights Reserved. | Sitemap | login.